Is This What the Google Pixel 3 Smartphone Will Look Like? Here’s a rendering of what the Pixel 3 XL might look like based on an alleged screen protector that leaked on Weibo earlier this week. After an image that allegedly shows screen protectors for Google’s third-gen Pixels popped up on Weibo earlier this week, smartphone fans immediately started imagining how the shape of the screen protector might reflect the phone’s final design. And of course, some of the fans took the available evidence and spun up some impressive mock ups that give us a sense for where Google might take its phones this fall. Let’s take a look. Assuming that leaked image is legit, the screen protector has already answered the most important question about the Pixel 3: notch, or no notch? Well it seems even Google was on the fence about that, because based on the shape of that leaked screen protector, the standard Pixel 3 will be cutout free, while the Pixel 3 XL will feature a notch at the top. This could be a bit worrying because between the Pixel 2 and Pixel 2 XL, it felt like Google put much more time and effort into making the larger model the better device. Compared to the XL version, the standard Pixel 2 had significantly less battery life, and a lower-res screen instead of the QHD panel found on the Pixel 2 XL. The hope is that Pixel 3 is that it won’t be worse than its bigger sibling aside from the actual screen size will be almost exactly the same. That said, the most striking thing to me about the Pixel 3 XL’s imagined facade is the goofy little googly-eye face that results from the phone’s dual front cameras and earpiece. Basically, there’s a little o_o at the top of the phone that stares right back at you, and once you see it, it doesn’t go away. 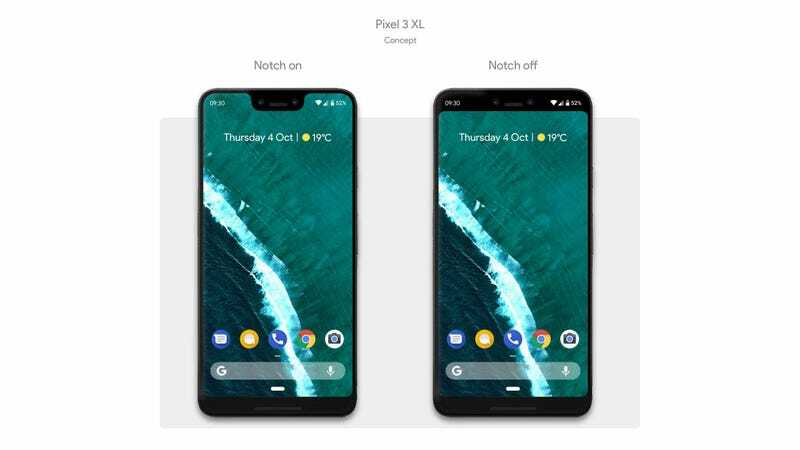 However, if you take a look at a render above made by the folks over at PhoneArena which features a concept of both the Pixel 3 and Pixel 3 XL, you can see that the standard Pixel 3 features a more traditional design with decent-sized bezels above and below the screen, with a slightly altered front camera setup that avoids conjuring up images of a surprised emoji face. Importantly, the leaked screen protector’s design also suggests that Google isn’t ditching the Pixel 2's front-facing speaker, which sits below the screen and probably works in tandem with the phone’s earpiece to produce stereo audio. Another thing to note are the dual front cameras themselves, which is a marked change from the single selfie camera found on the current Pixel 2 and Pixel 2 XL. This would be a first for any Pixel phone and could pave the way for some sort of Google-made 3D capable face recognition tech similar to Apple’s Face ID. The addition of dual front cams also means that Google might add dual rear camera to the phone’s back as well. Previously, Google relied on the strength of its impressive HDR+ photo processing in order to keep pace with competitors. But after two- years, it seems Google is finally catching up to the pack by jumping on the dual-cam bandwagon. After looking back and forth between these renders for a while, I gotta admit the Pixel 3 XL’s style is already starting to grow on me, silly grin and all. Looking back, the original Pixel was quite ugly, and while the Pixel 2 offered a more refined aesthetic, it didn’t have the same kind of charm or personality you get on other flagship phones like the P20 Pro or Galaxy S8/S9. But that Pixel 3 XL up there? That thing has character. Unfortunately, while these renders have given us the best look at what a real Pixel 3 could look like, there are still even more unanswered questions we’re dying to know. Is Google going to stick with OLED screens for the Pixel 3, and if so, will the display be made by LG, Samsung, or someone else? Or what about wireless charging, or maybe even the possibility of the Pixel 3 getting a headphone jack? Right now, we just don’t know, and until we do, probably this fall, some of the most fun we can have is playing the “What if?” game while we wait for Google to spill the beans. [Update 6:45 PM ET] Here’s one more render from @PhoneDesigner on Twitter showing another glimpse at what the Pixel 3 and Pixel 3 XL might look like.